UPDATE-July 2018: Please check back frequently for soap availability. We are now filling out of state orders, so quantities can change quickly! 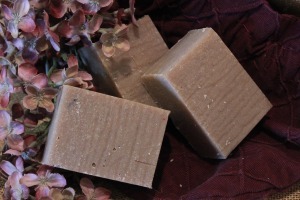 Goats’ Milk Soaps are found to be gentle on the skin and may even relieve some minor symptoms of skin irritations. 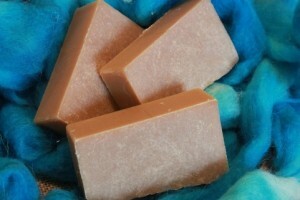 All soaps are made with sustainably harvested ingredients, and may include Coconut Oil, Palm Oil & Olive Oil. Other ingredients will be listed in the descriptions. 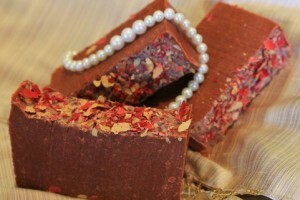 All soaps are $5.00 per bar, approximate weight of each is 4 oz. Packaged in an organza gift bag. Shipping is determined at checkout. 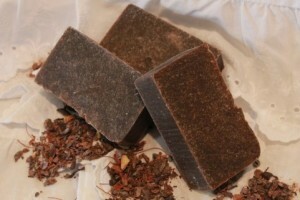 No fragrance oils are added to this soap. A fresh, gentle, scent reminiscent of a recent rainfall. Makes a nice lather! Has a beautiful blue swirl design. Kiss Me Now - in stock! Sweet Vanilla Chai -in stock! Great scent for the guys, but not overpowering. 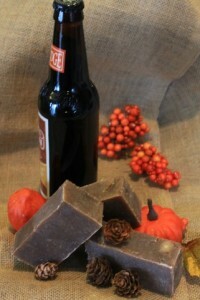 Bubbly lather with hints of Pumpkin Pie spices. Lavendar buds accompany soft scents of lavendar with a hint of color. Peppermint scent with a hint of candy cane like coloring.